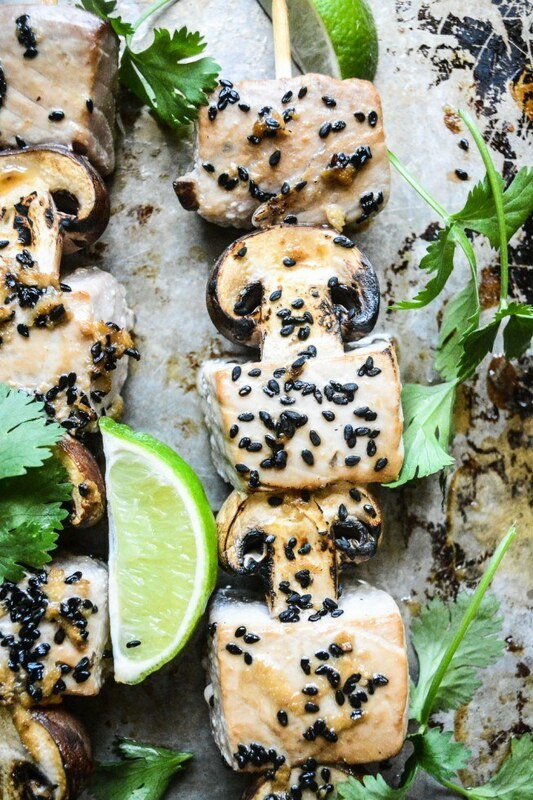 Ahi Tuna and Cremini Mushroom Skewers are the ultimate easy summer meal! Thread 4 large skewers with the tuna and the mushrooms and lay them in a baking pan long enough to hold them. Mix up the marinade ingredients and pour over the skewers. Cover and refrigerate for an hour or so, turning the skewers halfway through so all sides get to the marinade. If you are grilling outside, grill the skewers for just a few minutes per side over a hot grill. It helps to use a grill pan over the grates so the fish doesn't stick. If you are using a stove top grill, do the same. Make sure to brush the pan with oil before you lay down the skewers. If using an oven, remove the skewers from the marinade and set on a lightly greased baking pan. Bake at 400F for 5 minutes, then finish under the broiler, on the closest rack, for a few more minutes. Ahi should be a little pink inside. If you like it very rare, put the fish and mushrooms on separate skewers and just sear each side of the fish over high heat. Serve with a sprinkle of fresh cilantro and lime wedges. Sometimes I will serve the skewers right on top of a simple salad, and for a heartier meal I will serve over a grain like couscous or quinoa.